What can I say? I love sushi and almost anything Japanese. 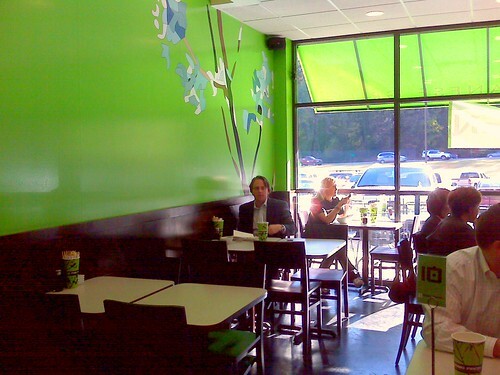 Walking in I noticed the decor was consistently a pleasant lime green with modern Japanese floral artwork on the walls. Each table had a container with disposable chopsticks and a few little ceramic soy sauce ramekins and a modern looking soy sauce bottle. An open prep line and kitchen allowed me to see the quality of the fresh ingredients. As I was checking everything out, one of the owners approached me and informed me of the details of ordering and told me about the fresh sushi that you could apparently “grab and go” with an innovative “self-checkout” type terminal up front (credit cards only). 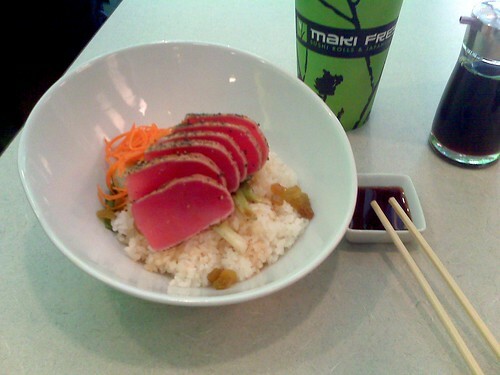 After looking over the short but concise menu, I decided on a Rice Bowl with Seared Ahi Tuna. I was given a “number on a stick” (same system as Newk’s or Zoë’s) and my bowl was brought to my table after a short wait. The presentation was impeccable and the color of the tuna was a bright red (as you can see below). The ingredients included scallions, julienned carrots, paper thin sliced cucumbers and – check this out – golden raisins! The tuna was the perfect temperature and melted in my mouth and, believe it or not, the golden raisins were a great sweet compliment to the soy citrus vinaigrette that was spritzed on the cucumbers. As I left, I swiped a sample of their famous Green Tea Cookie Bites which were quite tasty. As I drove home I had a good feeling in my tummy that I had eaten a great tasting AND healthy meal today. 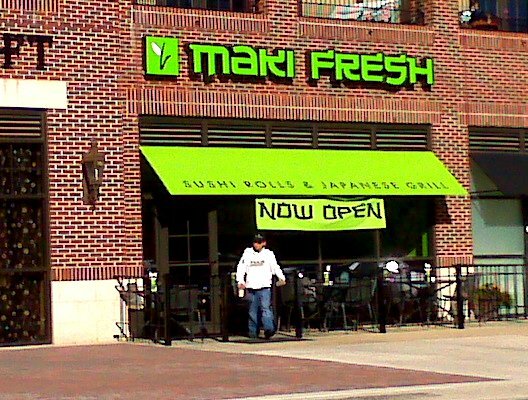 If you’re a fan of Asian / Japanese cuisine give Maki Fresh a try. They are located in the new Cahaba Village Plaza next to Diamonds Direct and across the street from Whole Foods (directions). Josh Self is a “self-proclaimed” food connoisseur. He usually cooks his own food at home but likes to go out to eat a lot with his fiance’ Andrea. Josh has worked in the restaurant industry for over 7 years as a cook, server and lead trainer and is currently employed with The Cheesecake Factory (5 years).